MENS ANTIQUE RIVET 32 X 34 JEANS. Shipped with USPS Priority Mail. I REMOVED TAGS BUT I'VE NEVER WORN THEM. BUTTON POCKETS ZIPPER FLY. Light wash, boot cut jeans with white leather and studding detail. Size 36 (equivalent to a size 18. Inseam= 32”. ). Jeans are in very good "distressed" condition. New without tags mens antique rivet jeans size 34/32. Open to offers and no returns, thanks. 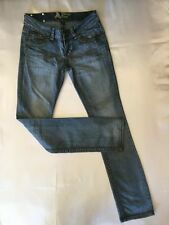 Antique Rivet Mens Jeans Worn Once 36x34 Bootcut 125.00 New. Condition is Pre-owned. Shipped with USPS Priority Mail. Antique Rivet. These are great jeans! Studded crosses on pockets. Embroidered logo on back. Inseam 29". Waist 13". Antique rivet jeans. Dark wash studded wash. 29” inseam. 13.5” across waist. Antique Rivet Men's Distressed Jeans Size 36" W x 33" L. Condition is Pre-owned. Shipped with USPS Priority Mail. Waist: 33". Condition: Nice and clean. Color: Blue. Inseam:32". Antique Rivet Jeans Mens 32 Waist 30 Length. Condition is Pre-owned. Shipped with USPS Priority Mail. Antique Rivet Women's Rhinestone Bootcut Jeans Size 30. Condition is Pre-owned. Shipped with USPS Priority Mail. ML048101224 in.25 in.26 in.27 in.28 in.29 in.30 in.31 in.32 in.